Pleni Naturals was founded by former aesthetician, Allyson. The concept for Pleni Naturals was inspired by Allyson's passions: nutrition, skin care, and her two small children. She wanted to create a wholesome line of natural and organic skin care products for babies and kids - and help them develop a lifelong love for their veggies. Allyson's insight from her 15 years of experience in skin care and from her hands-on job as a mom is thoughtfully crafted into every Pleni Naturals product. Pleni Naturals products are full of yummy ingredients like apples, oranges, vanilla and cranberries. Our absolute favorite is the cucumber and grape baby oil. 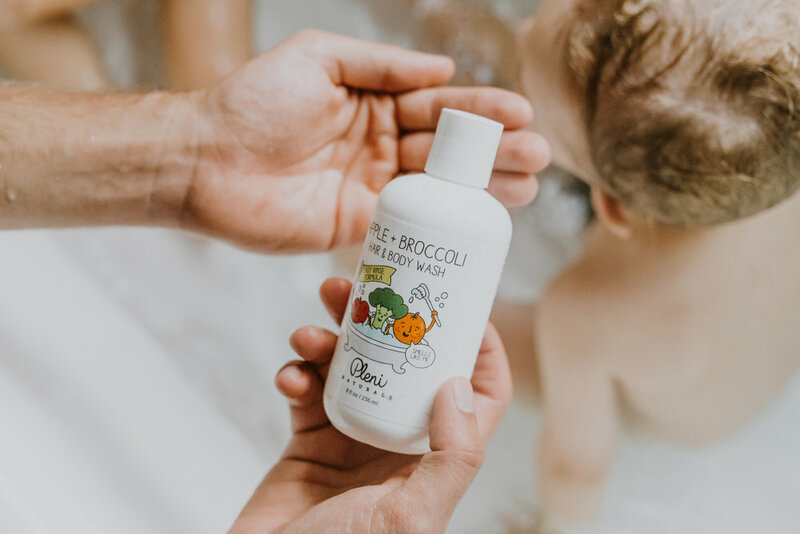 This protective oil, brimming with nutrient-rich grape and cucumber seed oil, is the perfect after-bath massage base to calm, protect and soften baby’s skin. We also love the apple and broccoli hair and body wash. Clean and hydrate baby's hair, scalp and skin gently yet thoroughly with this high-foam and easy-to-rinse shampoo and body wash that's bursting with broccoli seed oil, California grown organic olive oil, and other beneficial and natural fruit vegetable-based ingredients.